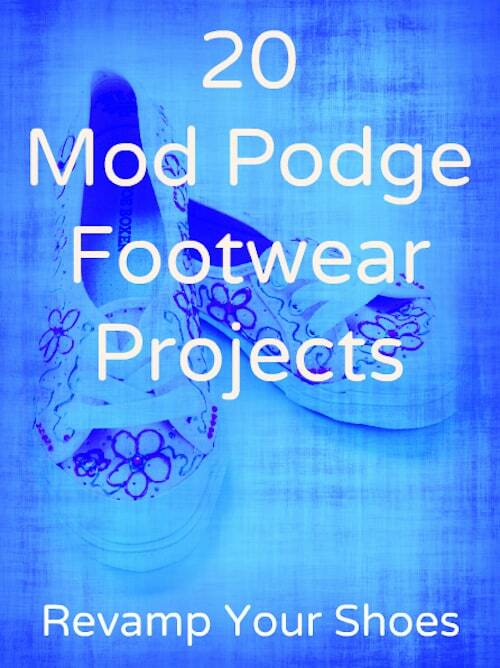 Mod Podge shoes are a great way to revamp your wardrobe on a budget. 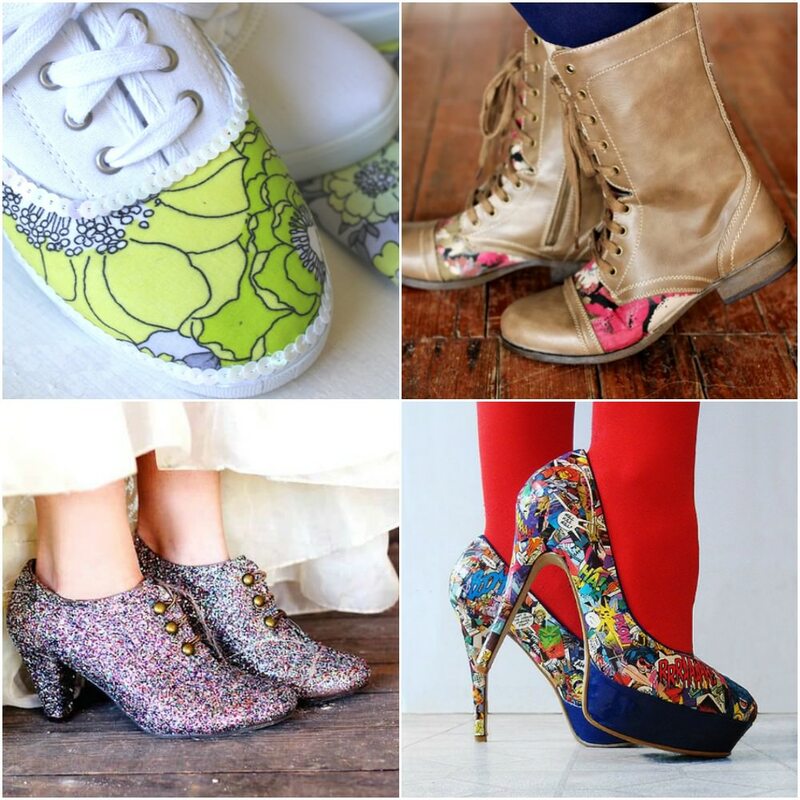 Here are 20 inspirational ideas – pick your favorite DIY decoupage shoes project and get crafty! Don't forget to scroll down to the bottom of the post to get a bonus video for adding a no sew cuff to boots with Mod Podge. Skills Required: Advanced Beginner. I believe it's probably best to have some experience with Mod Podge given that you're going to have to work around the shape of shoes and seams. You are going to laugh – I've only Mod Podged shoes a few times – once for my book, Mod Podge Rocks. BUT I have a pair of heels as we speak that are ready to be Podged. 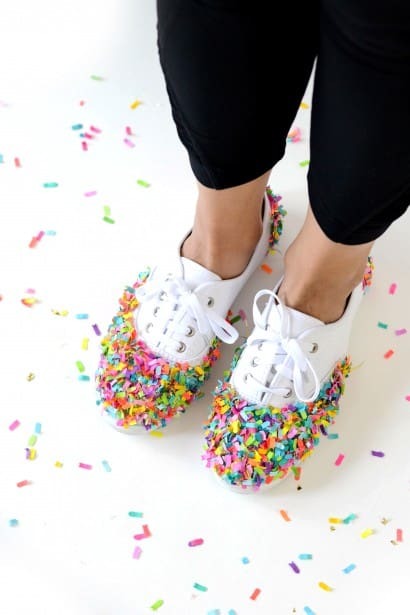 There are so many reasons to Mod Podge shoes. You can customize them to fit your personality, you're upcycling, AND it's the perfect budget craft. Before we dig in, you might have some questions about decoupage shoes, and I'm more than happy to answer them. What Can I Mod Podge to Shoes? I've seen it all, my friends – napkins, fabric, paper. I'll say that cotton or cotton blend fabrics work better than poly fabrics in my opinion. I'm also not a big fan of silk or felt because it discolors and gets a weird texture. I always go for medium weight or thinner when Mod Podging shoes because you have to go around a lot of round edges. You'll see in the tutorials below that some people use very thin items, even napkins, to decoupage shoes. If that's the case, keep in mind that you might be able to see the background through the item when you Mod Podge it down (so you might want to paint your shoes white or use white shoes). If I had to choose one formula, it would be Fabric Mod Podge. It's highly water resistant (just like Mod Podge Outdoor), and it's made for bonding fabric to fabric, which is a likely scenario if you are going to decoupage shoes. Outdoor Mod Podge is a close second, but it's thicker and therefore harder to work with. Technically you can use the regular formulas (Gloss or Matte), but those aren't made for exposure to water so you need to seal them very well. How Do I Seal Them? If you use Fabric Mod Podge you can leave them as-is. It might take awhile for them to fully cure and the tackiness to go away, especially depending on the climate you live in. Therefore I'm a big fan of spraying or brushing on a clear acrylic sealer in the finish of your choice (Gloss, Satin, or Matte). Minwax Polycrylic is a big favorite with a lot of people. You can really use anything – just make sure it's clear, and acrylic. I always do it because hey, there's nothing wrong with making the shoes even more durable. Are you ready to jump into the tutorials?? Some of these decoupage shoes are easier than others (go for glitter if you're a newbie to Mod Podge) but all are amazing. I can't wait to Mod Podge my own shoes and share with you. 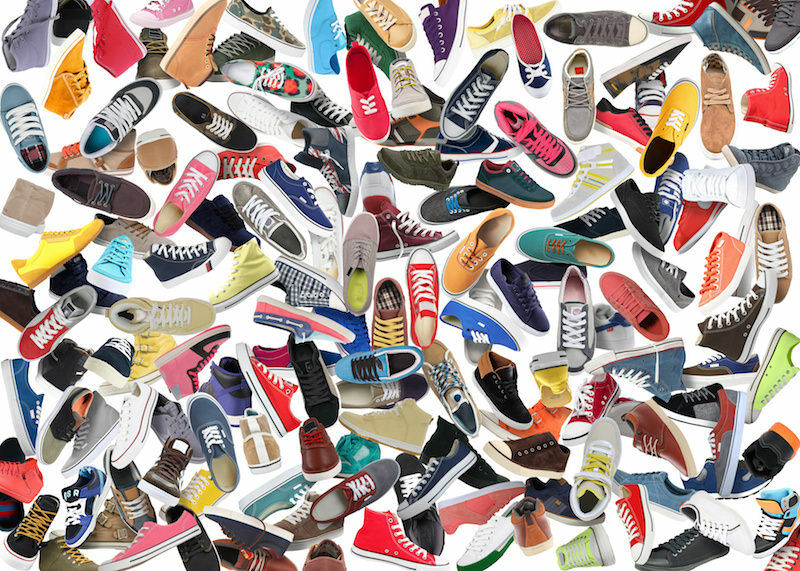 In the meantime, enjoy these 20 Mod Podge shoe projects! 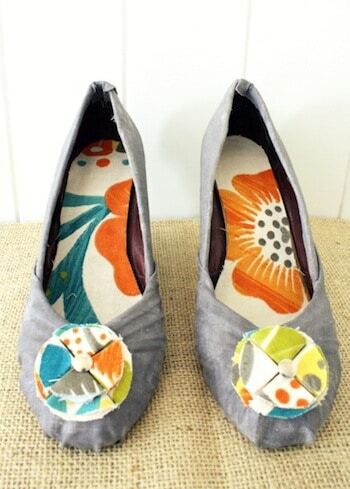 Turn old wedges into new ones with a bit of fabric and Mod Podge. Mandy got these from a garage sale for $1! Don't throw those old flats away – instead, add a design of your choice to the toe with glitter! We decided to add a heart. I'd never seen napkins decoupaged to shoes before this project! Love them – and love that they are comic book napkins to boot. 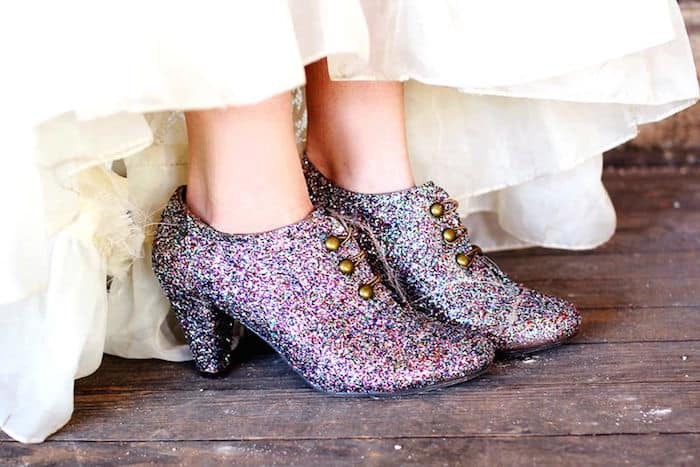 The type of glitter used here makes these decoupage shoes some of the most spectacular I've ever seen! What do you think? 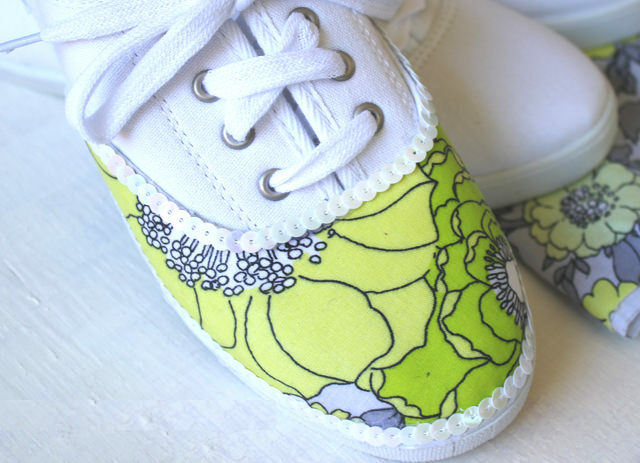 If kids wear out the tips of the toes on their shoes, you can make them new again with fabric and Podge. Not only does Cathie Mod Podge shoes with fabric, but she adds a fantastic sequin trim around the edge. They look amazing! You don't have to cover an entire pair of shoes in fabric and Mod Podge – sometimes just a little peeking out looks nice, too. 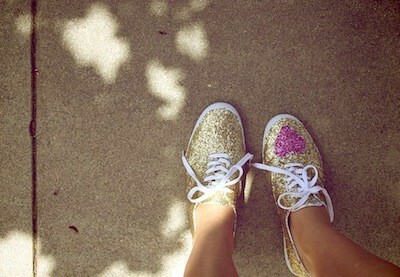 I love that these are glitter Mod Podge shoes – with a little bit of added heart. Think of all of the colors of glitter you could use with this method . . .
Make boring solid color heels look fun and interesting with your favorite comics – then wear them to ComicCon. Okay, so maybe you wouldn't wear these every day, but they are unusual and cool, so I feel like you need to see them. 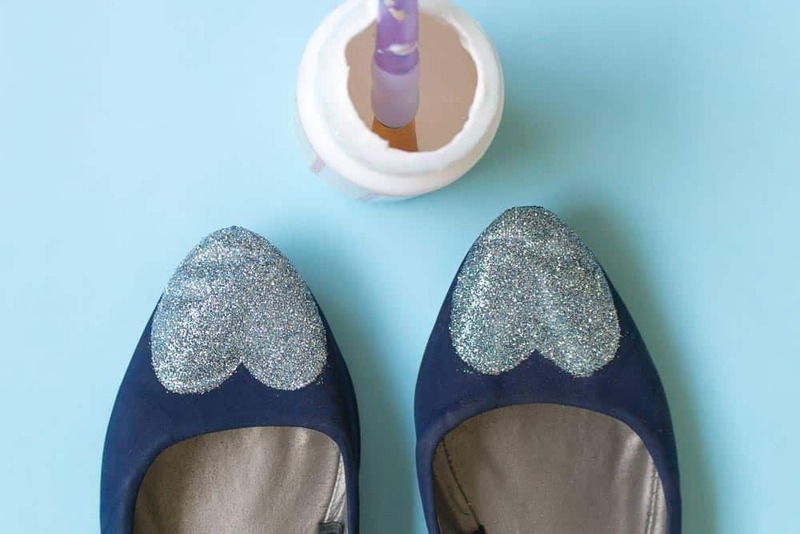 Glitter and Mod Podge are the perfect craft supplies for fixing up scraped heels. These Mod Podge shoes would be perfect for a wedding, elegant party, or New Years! The fabric and thumbtacks that cover the edges of these wedges provide a nice contrast and a little extra flair. 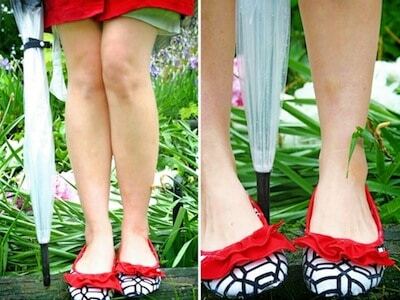 Turn plain black shoes into summer ready flats with a bit of paint and Mod Podge. I just love the pop of blue neon. A pair of flats gets a fun summer makeover with Ashley's favorite fabric. 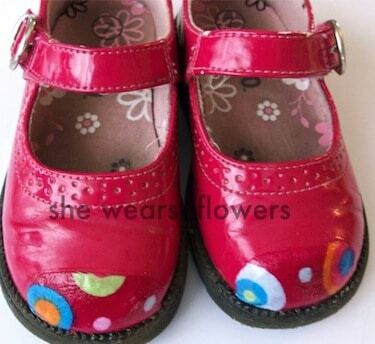 If you want to try Mod Podge shoes, these are a great place to start. Fabulous fall boots get a floral makeover with some pretty fabric. 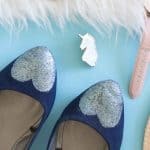 You can decoupage shoes that are faux leather or real leather – both work! 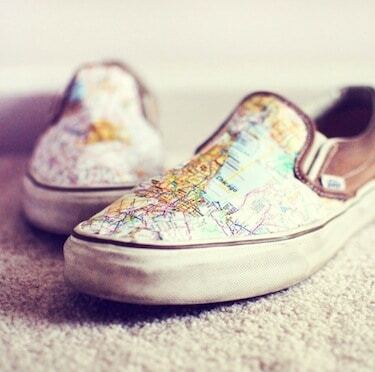 You can Mod Podge paper to shoes as well – that is exactly what Mandy does with these maps. Decoupage is perfect for making plain heels coordinate with an outfit, like Amy did with her dress. I love the fabric that Cathie chose for these flats, and also the addition of tiny gems as embellishments. 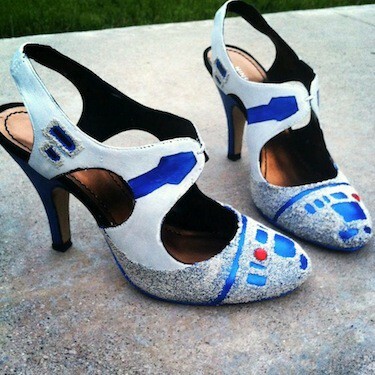 These nerdy R2 unit heels are perfect for channeling the force. Then you just need to wear them with something here. These Mod Podge shoes not only got a fabric makeover, but the addition of bright ruffles is super fun! Everyone has a pair of boring black pumps – give them new life with fabric and lace. I had a terrible recent experience with trying to put fabric on shoes. I didn’t use Mod Podge because I couldn’t find the fabric variety so I used something else I found at Walmart. The shoes I made came out horrible! They were stiff and scratchy, and my daughter will NEVER wear them. I was pretty disappointed. Hi Susan! I would give it a try again one day with Mod Podge and cotton fabric. Not sure what you used, but Mod Podge works great. You don’t need the Fabric kind – though it is more durable and waterproof, you can still add an Outdoor sealer and have it be fine unless someone is puddle jumping 😀 Also, even cotton will be slightly rough with Mod Podge (though not “scratchy”) – you can’t apply any glue to a fabric and have it remain completely smooth. These all look awesome!! I definitely want to try the pretty fabric ones. So many fun ideas! 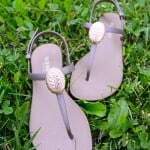 I just finished a pair of flip flops using fabric mod podge and my son loves them! I don’t know how I missed this! Thank you so much for featuring my Mod Podge Wedges, Amy! Super awesome projects up here, so much inspiration! Help! 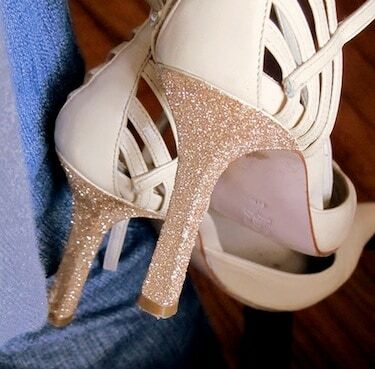 I made glitter heels and every time I wear them the glitter flakes off! What am I doing wrong? Hi Audrey! 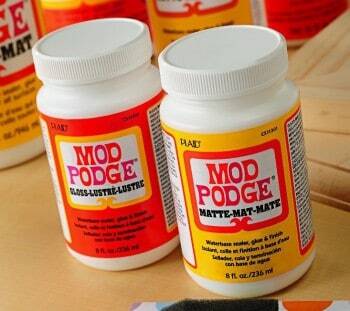 Did you seal over the top with Mod Podge or another sealer? That will help. A clear acrylic spray sealer is probably better because Mod Podge will dull the glitter a bit more. I used mod podge. I didn’t think it dulled the glitter. I’ll try again with the sealer. Maybe the sealing layer of mod podge made it too thick and that’s why it chipping. Thanks for the help! omgee PLEASE send me the link for the comic book strip heels im in love! This is a cute idea. Does anyone have some idea of how these hold up over time? 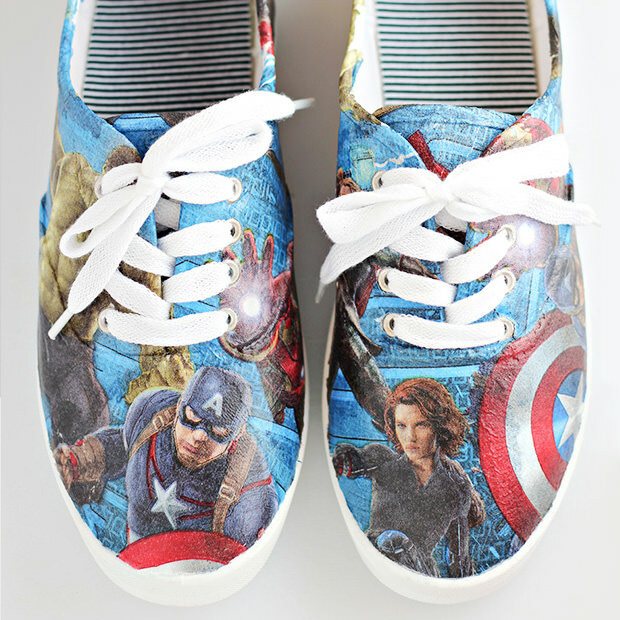 i purchased the fabric Mod Podge is that ok to do comic book shoes with? Hi. I want to make fabric shoes with fabric for my wedding. i got these shoes on sale and the are man-made satin. will the modge podge work? Hi Danielle! I think so – but you need to do a small test in the least visible area possible. The reason I say that is because I’m not sure what “man made” satin entails. 😀 Good luck! Hi, Im completely new to this – stumbled across it when looking on how to upstyle my wedding shoes. Hi Shell! I don’t recommend paper on Satin – fabric would work. So I’d use fabric, any type of Mod Podge (gloss or matte) and then some brush on sealer.